Learn more about our Healthy Brain Services. FirstLight offers specialized care to support brain health. It’s never too early to start doing whatever it takes to keep your brain young, healthy and active. Sustaining healthy brain function and keeping the mind sharp at any age may be more important than you think. “There have been several studies on the impact of how maintaining a healthy brain can help prevent early dementia and even diseases such as diabetes,” stated Jeff Bevis, CEO and Co-Founder of FirstLight Home Care. FirstLight is thrilled to announce that it is expanding its services to include Ageless Grace, an innovative program that can help individuals maintain a healthy brain. We have already begun offering Ageless Grace training to our franchise owners and managers so that they may, in turn, train our caregivers. The customized curriculum was developed by Denise Medved, founder and creator of Ageless Grace, specifically for FirstLight Home Care. 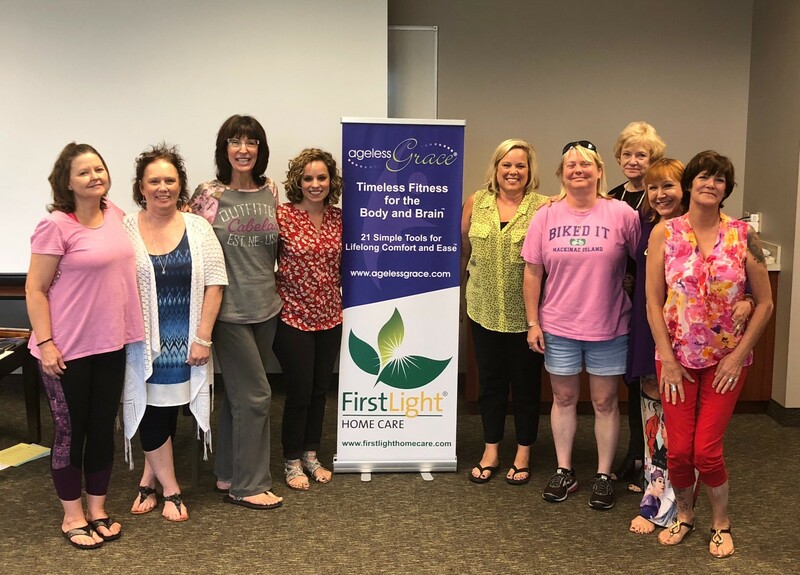 FirstLight Home Care has begun training owners and managers on the Ageless Grace program so that they may take the training to their caregivers. Bevis says the company plans to continue educating FirstLight franchise owners across the country with the goal of offering the Ageless Grace program to FirstLight clients in up to 100 markets by mid-2019. Ageless Grace is a cutting-edge brain fitness program that is meant to exercise the body and stimulate the brain. The exercises, based on neuroplasticity, activate all five functions of the brain – analytical, strategic, kinesthetic learning, memory/recall, creativity and imagination. The Ageless Grace program consists of 21 simple exercises focused on natural, everyday movements and is designed for all ages and abilities. Medved created Ageless Grace based on her own experience with her parents’ health and observing the different ways they were aging. She wondered if there was a way to keep both the body and the brain healthy as we age. Medved spent seven years with a Duke University-affiliated hospital and a university graduate department to develop this creative approach to aging. Read more about our partnership with Ageless Grace.